3M Tegaderm™ HP Transparent Dressing offers greater adhesive power for a strong hold, even under challenging conditions including hot, humid environments. Especially useful for diaphoretic patients. It is a breathable, transparent film dressing, impermeable to liquids, bacteria and viruses, and is designed for protecting skin and wound sites. Versatile film can be cut to any shape and size. Transparent dressings allow easy monitoring of wounds and I.V. sites without the need to remove the dressing. 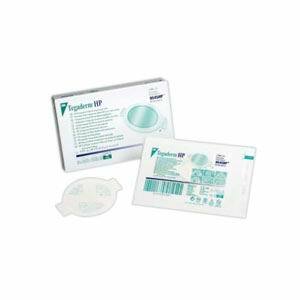 Perfect as a primary or secondary dressing over acute wounds, surgical sites and chronic wounds or over an at-risk I.V. site. Picture frame delivery has a secure adhesion, yet is gentle to the skin. More adherent in moist conditions. Dressings conform to the body and flex with skin for greater patient comfort. Available in special shapes to better fit body areas.